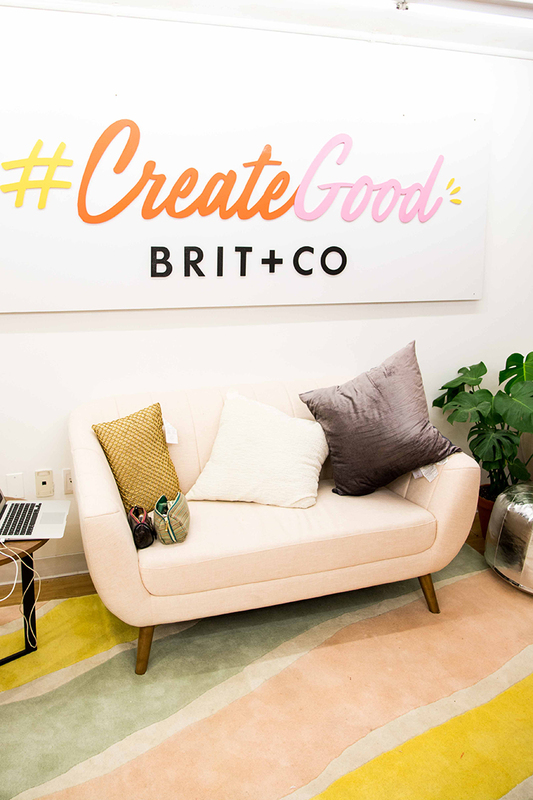 Creating Good with Brit + Co. 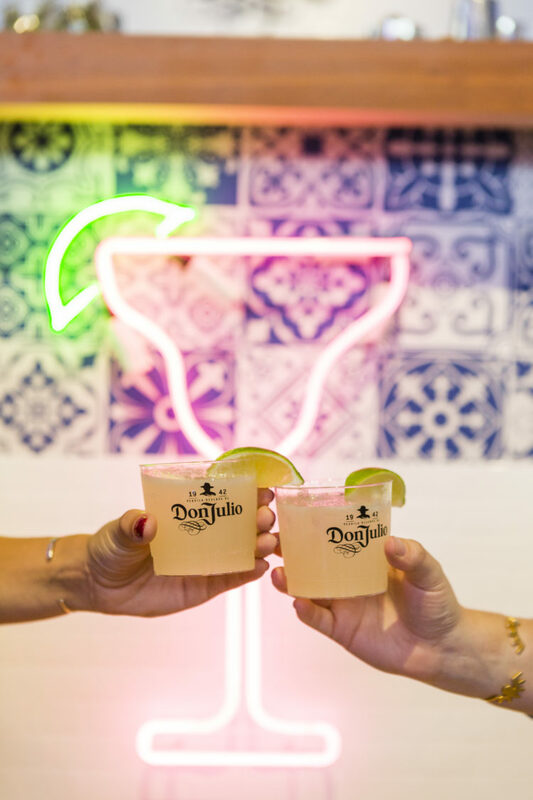 Living and working in New York City means that we have the opportunity to experience a lot of really cool events, but it's always our favorite when we get to be involved in actually producing those events. 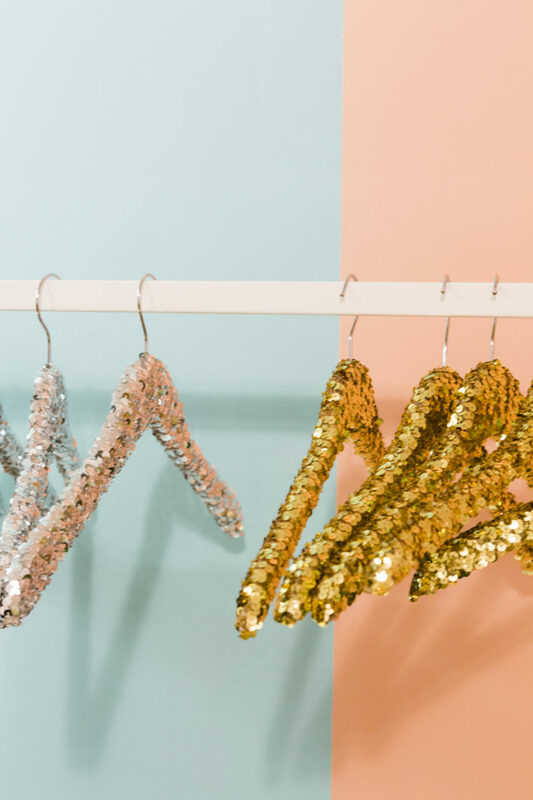 Maggie and I went to college with our friend Kelly, who lives in San Francisco and happens to be the DIY Designer for Brit + Co. Every year, Brit + Co. works tirelessly to produce incredible pop up events, including Re:make, which has been held the past few years in San Francisco. 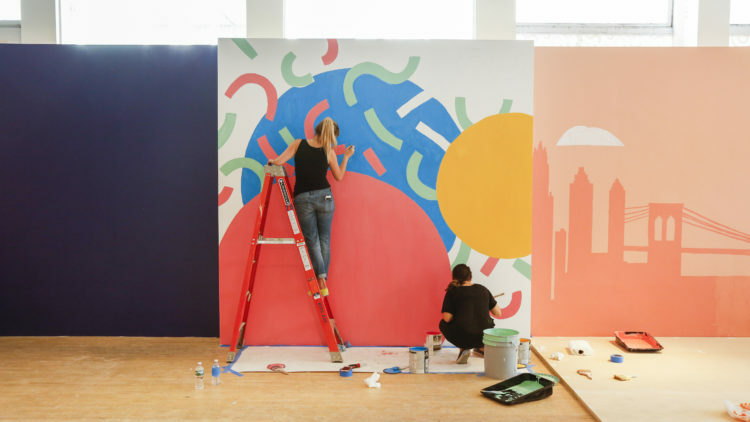 This year they decided to bring their efforts to NYC for #CreateGood, a pop-up experience centered around inspiring women to be their best selves and encouraging them to be the most confident, creative versions of themselves. Which is, of course, right up our alley. Kelly and the team at Brit + Co. asked if we could not only help them build the event, but also design a few spaces within the event, and we were so excited to participate! One of the sections of the event that we helped to build were the sensory rooms, which represented each of the 5 senses. This event took place in an old American Apparel, so there were some fitting rooms built in, so each was repainted and repurposed. There was the "Smell" room, which was painted to look like a watermelon and included a bunch of watermelon air fresheners so when you stepped in it it smelled entirely like watermelon. The "Sound" room had a bunch of xylophones screwed into the wall so that whoever entered it could play them at will. The back of the door had a pair of sweet glitter headphones, which I painted on. 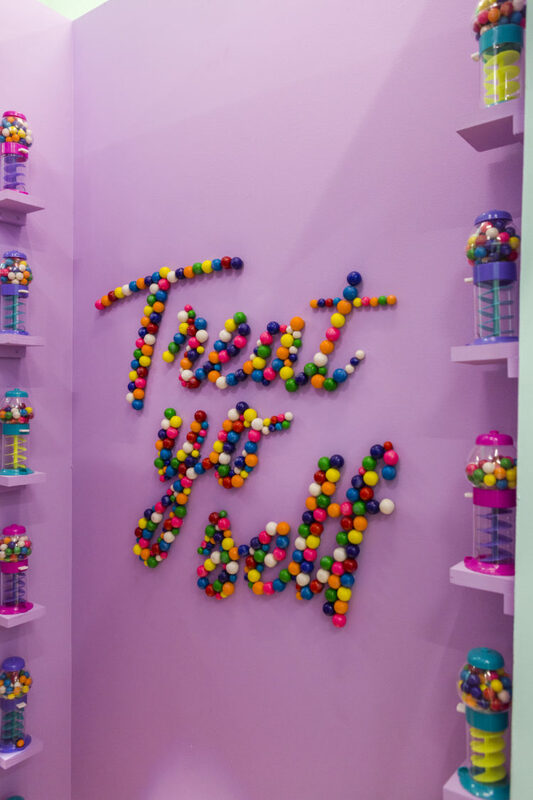 The "Taste" room was filled with mini gumball machines on shelves that Kathleen built, and the walls were filled with gumball art, including swirls, dots and a big "Treat Yo Self", made of gumballs. The "Sight" room had a bunch of tchotchkes glued to the wall, which were spray painted hot pink. 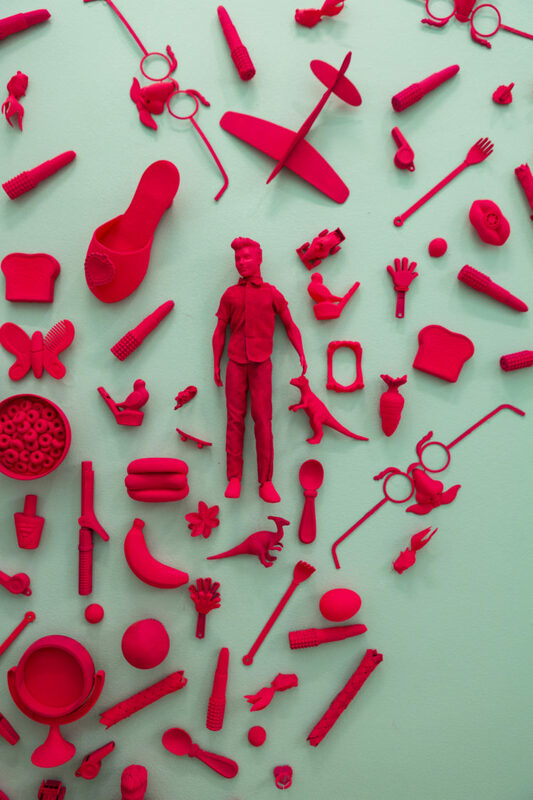 You had to search the items and find the frog hidden among them! Finally, the "Touch" room had a bunch of cool, different textured fabrics stapled to each wall, so people could enter the room and feel every surface. We also helped to paint and build a few more spaced on the main floor, including the epic yarn wall, for which Maggie hand-stapled and zip tied each skein of yarn. Maggie and I traced and painted this abstract wall, which acted as a backdrop for the Mixbook mailing station. 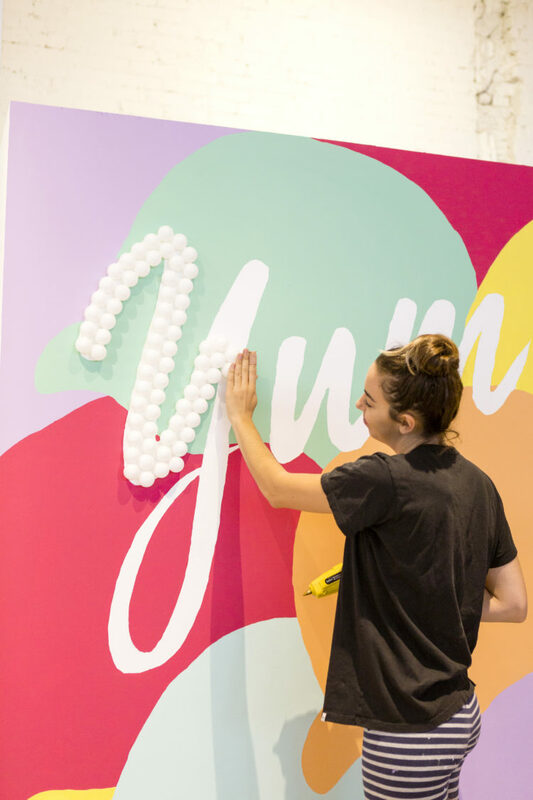 We helped our friend Kelly trace and paint the ice cream "YUM" wall, which acted as backdrop to the Talenti Gelato station. 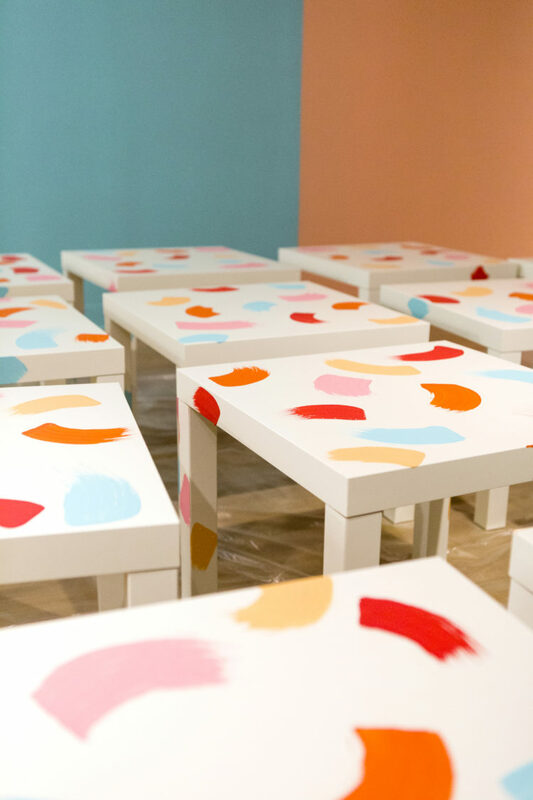 One of the special events that Brit & Co. hosted in the space was a Disney's Coco- themed family brunch on Saturday morning, for which me and my friend Ali painted these awesome white Ikea tables for the kids to sit at. 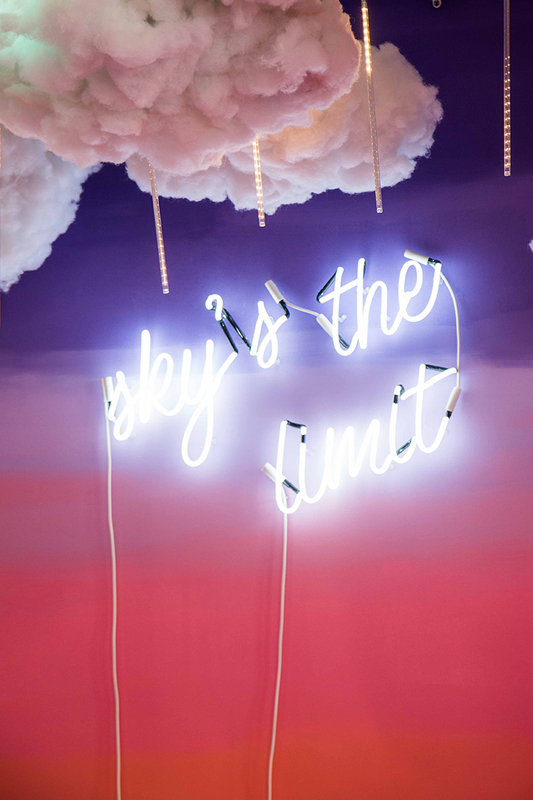 Throughout the rest of the upstairs, there were a million other Instagram-worthy areas, including the Don Julio Bar (with free cocktails), the Tattly Temporary Tattoo station, the Coco Guitar Wall, the Sorel Foot-Selfie floor, the Arcade, the Kia "Sky's the Limit" Lounge, and the #CreateGood Stage. We were asked by Brit + Co. to create some floral arrangements for the days of the event, which ended up being absolutely stunning and fit so well within the decor of the space. Downstairs, we took the reins in designing some cool spaces, including the green room where the talent would be getting ready before going out on stage for their presentation. Maggie created an epic yarn wall backdrop behind the hair and makeup station, using yarn and pom poms. We spray painted some cardboard letters that spelled "Lookin' Good, Feelin' Fine", which we affixed to the wall above one of the couches in the green room lounge area. We also designed two separate vignettes, one warm and one cool, which acted as little video sets where behind-the-scenes interviews of the talent were conducted. As you can tell, we had the best time being a part of this event, and could not be happier with how everything turned out. Thanks again to Brit & Co. for including us! Photos via Brit + Co. and Maggie Antalek.